For real overclocking you need liquid nitrogen and helium. All you need to do in winter is open your window. The Phenom II Z940 processor from AMD provides a maximum clock rate of 3 GHz out of the box. Now news from Slashdot.com reports that a group of overclockers has increased the rate to 6.5 GHz, an apparent new record. The trick was to get temperatures down to minus 232 degrees Celsius, close to absolute zero. We didn't want to go to such extremes in our own testing, so we simply put the test system on the window sill at 5 degrees Celsius. We then did an overclocking, even though our mainboard was a bit old for the Phenom II. The Asus M3A78-EM motherboard provides a few tuning possibilities, but the BIOS completely ignored the frequency multiplier setting. Instead we used one of the three available overclocking profiles for five, eight and 10 percent faster rates. We started the first test at 5%, but soon discovered to our surprise that /proc/cpuinfo showed a 3,000 MHz frequency even under load. The benchmark results then improved markedly. As a control, we raised the Z940 to the maximum 3.3 GHz allowed by the overclocking profile and, alas, the benchmark results were even better. Power consumption was also higher, showing that the CPU was truly running at 3,000 MHz, even though it had little effect on the 64-bit openSUSE 11.1 kernel. We then wanted to see how far we could go and raised the rate above the reference clock to 3.75 GHz. The result was a panic error from the openSUSE and Ubuntu 8.10 kernels and the CPU could no longer keep up. Running at 3.375 GHz was still OK for the Phenom II, but 3.5 and 3.6 GHz showed sporadic crashes. An even colder environment and better test technology might have pushed the Z940 a bit further. 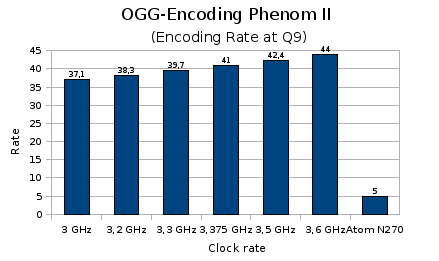 The standard Phenom II had improved our .wav file conversions by a factor of 37. A little overclocking brought the rate to a factor 44. Compare that with an Atom N270 CPU. A glance at the graph might prompt the reaction that the the Phenom II is eight times faster than the Atom. Not quite correct, because the graph shows only a single core. In actuality, the AMD CPU can convert four .wav files with a factor of 38 into Ogg Vorbis format, working at about double clock rate with a resulting factor of 30 faster than the Atom N270. Naturally we also started a short test on the i7 system. Needless to say the AMD clearly beat the equally clocked quad processor from Intel. The i7 (without overclocking) reached a factor of 33. Our Ffmpeg benchmark, however, proved the Intel ahead by a nose because of its hyperthreading support, and the AMD CPU had to be clocked at about 3.8 GHz to achieve the same results. In testing the Phenom II X6, Linux Magazine noticed that AMDs new processor doesn't have the full performance under the current Linux kernel. A bug in Linux power management throws a wrench into the six-core processing. A recent Linux Community test compared the AMD Phenom X4 with a Turion X2 and Intel P9400. Meanwhile AMD has sent us its new Phenom II processor, prompting a new test. These are the latest benchmark results. No, I did not increase voltage yet, as the CPU is supposed to work for a longer time Actually the cooler we used is not designed for real overclocking, the Phenom II has much more to give, we know. But perhaps you can post your settings, so other readers can test them as well.